Hi, cardmaking buddies! So excited for World Cardmaking Day! For the first time here at a2z Scrapbooking Supplies, we’re celebrating with some blog fun. First, take a look at this z-folded card I made…it’s my first fun-fold card. I love watching videos of how talented people create crazy fun-fold cards like those box cards that open into a 3-D project, but they seem too complicated for me, so I stay away from fancy stuff 🙂 This was super easy, though, all I had to do was cut an 5.5″x11″ piece of cardstock, score it in the middle and then score and fold back the front piece. And just for World Cardmaking Day, only our favorite readers and customers (that’s you!) get a 25% discount on the store! From October 7 (8am EDT) until October 8 (11:59pm EDT) you can pile whatever you want into your cart and then enter the code WorldDay25 and bam! you get your discount (except the clearance items, which are already priced crazy low). Easy peasy, lemon squeezy. That means you get your discount on brand-new holiday stamps and dies like this adorable Color Layering Baby Penguin set or Winter Silhouette set from Hero Arts. You also get the 25% off for your supplies, like Nuvo Gilding Flakes and Glitter Paste, Chibi Lights, and the Wagner Heat Gun. And you get 25% off your basics, like Gina K 120 lb Premium cardstock, Hero Arts cards/envelopes and adhesives! Who can’t use a discount on more glue pens and Stick-it sheets? This weekend only, we have a flash challenge and giveaway to celebrate World Cardmaking Day. To enter create any card with a fun fold beyond the basic fold…a gateway fold, a z fold, or whatever fun way you think of to make your card just a little different from an ordinary card. Be sure to link back to us on your post, and enter your post in the rafflecopter directly below. If you do that by Sunday, October 8th at 11:59pm EDT, you’ll be entered to win $20 to the a2z Scrapbooking store. The Rafflecopter giveaway directly below has even more chances to win if you don’t have the time to create a card! Have fun, enjoy the creative weekend and stock up on some goodies to celebrate. Everyone who enters a card in this challenge this weekend will receive the free Hero Arts digital stamp, Spooky Labels. Perfect for Halloween treat bags, invitations or cards and scrapbook layouts—this set is exclusive to a2z Scrapbooking. We have the exclusive rights to all of the Hero Arts digital stamps, so if you want them, you can only find them here! Provide a way for us to reach you (through your blog or in the comments) and we’ll email the digital set to all our entrants. DT Member Donna used them for her classy treat bags. If you’re looking for some tips on how to use our Hero Arts digital stamps, Kristina has a video post here to walk you through some of the basics. They’re fun to use and easy and you can size them however you want. Often, I don’t even manipulate the stamp, I just print and color and add to my cards…but there are a lot of ways to use them. For more inspiration, check out DT member Leslie’s fun-fold card here and Cindy’s fun-fold card here. They’re amazing! Happy World Cardmaking Day! Oh, and check back on Monday, October 9th, to see the September Challenge Winners! Please join us in this month’s “Watercolor” challenge for your chance at a free digital stamp AND, if you used Hero Arts, a $20 gift card to our Hero Arts store. Our current monthly challenge can always be found in the menu bar, and runs from the 1st to last day of the month. Categories: Challenges, Digital, giveaway | Tags: Challenge, digi, digit stamp, free digi, giveaway, WCD 2017, weekend challenge, World Cardmaking Day | Permalink. Hi there, I’m here at a2z today with a card for our Anything Goes Challenge! Hope you can join in the fun and be eligible to win a $25 gift card to the a2z store! Just make sure you use one main Hero Arts product on your creation! I made the background with Distress Crayons, water and a baby wipe, then laid the stencil over the panel and used a stencil brush to add soft pink shadow ink on top for a fun design. I cut two butterflies and layered them and added gems, then stamped the Hero Arts sentiment in black ink. The polka dots on the side is actually ribbon from my stash. out of stock but you can special order it! 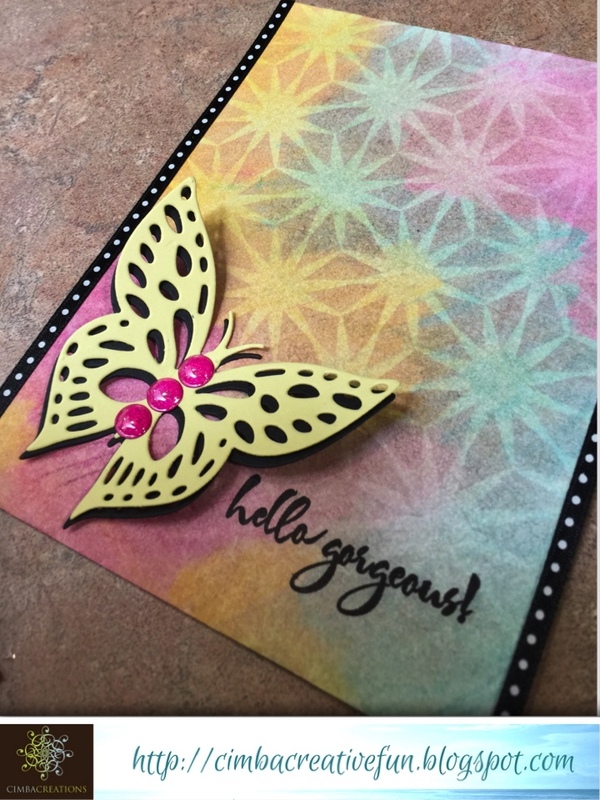 Categories: anything goes, Challenges, color layering, Friendship Cards, Handmade Cards, Hero Arts, Stencil | Tags: Angie, asian flower stencil, background, butterfly, Challenge, color layering, color layering flamingo, Hero Arts, shadow ink, stencil, swallowtail | Permalink. If your weather is rainy or snowy and you need something to do, don’t clean out that closet or rearrange the cabinets, enter our January Anything Goes Challenge here. I hereby challenge you! All you need to do is use a Hero Arts product for your main element and let people know you’re entering our challenge by linking back. You could win the $25 gift code to the store to add to your stash! Take a look at one of Karen’s entries this month. So sweet in these colors and she’s giving it to Meals on Wheels, how cool is that? 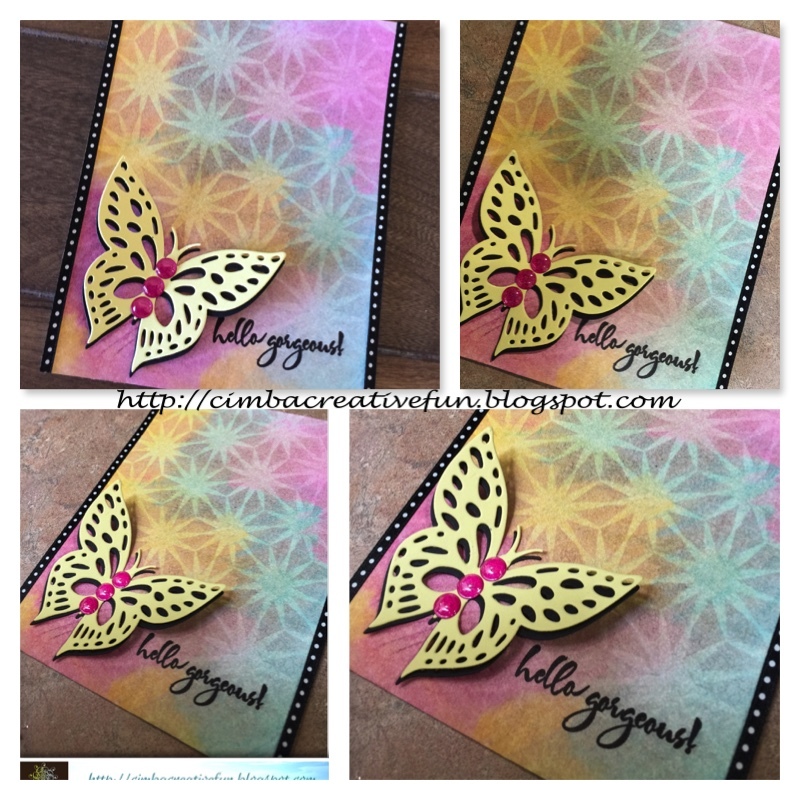 Maura entered this colorful lovely using some of my all-time favorite butterfly stamps. And Greta has just inked up her floral stamp for this embossed pastel beauty. Hope you’re inspired to join in this month’s challenge…it couldn’t be any easier! Thanks, ladies, for joining us and providing such wonderful projects for us to drool over. Categories: anything goes, Challenges, Handmade Cards | Tags: Challenge, entries, january 2017 | Permalink.